Carly Behm | The PHOENIX Kana Henning from Loyola Facilities said in the event of a fire or other emergency in Mundelein, the fire department would use an intercom system to instruct those inside on evacuation procedures. Originally, Mundelein was the main building for Mundelein College, an all-female, Catholic institution, until it was incorporated with Loyola University in 1991. Students could stay in the building during the day instead of having to go to different buildings for classes. Now, the building is primarily used for classes. 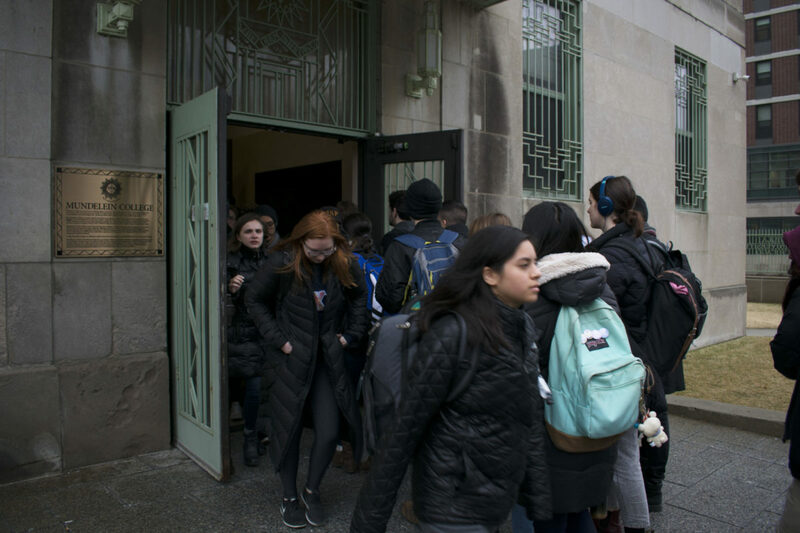 It has approximately 60 classrooms and as many as 2,500 people could occupy the building at once during the day, according to associate vice president for facilities Kana Henning. During class time and passing periods during the day, the stairwells often become congested and the line to the four elevators can extend outside the entrance doors. There are seven stairwells in the building, and four of them exit on the first floor, according to Henning. Loyola sophomore Makala Dillavou said she thinks an emergency situation could get chaotic in Mundelein because of this. Henning said Mundelein underwent renovations which concluded in 2014 to update the interior to the most recent fire and life safety codes for high rise buildings. The renovations included updates to elevators and the electrical and plumbing and installing a panel for communications. Requirements for high-rise buildings include an automatic sprinkler system, a voice communication system and an elevator recall system. The south entrance on Sheridan Road is currently being repaired for maintenance issues. This leaves two entrances for students in Mundelein. Mundelein passed its most recent building inspections last year, according to the City of Chicago website. The building also was constructed to keep a fire from spreading for at least an hour, according to Henning, meaning if there was a fire in one area of Mundelein, there would be time for people to evacuate before the flames spread to another section of the building. Henning said if there was a fire, the fire department would use the intercom system to instruct people on evacuation instructions. “You’re likely not going to have every person trying to evacuate at the same time,” Henning said. Loyola is required to release data about crime and emergencies on campus, according to the Clery Act. Fire logs are released for residence halls on campus. There have been three fires reported in residence halls on the Lake Shore Campus since 2014, according to the most recent bulletin. But Dillavou said she thinks some people would be more inclined to focus on escaping the building in a fire rather than follow procedures. Escape plans posted in Mundelein instruct people to use the stairs to evacuate and follow the escape routes outlined. “In a crisis situation, sometimes people get really crazy and just decide to do their own thing,” Dillavou said. Another concern some students have is if there was an active shooter in the building. In Parkland, Florida, 17 high school students were killed when a gunman opened fire inside the school Feb. 14. In the event of an active shooter, armed police officers on campus will contact the Chicago Police Department and enter the shooter’s area, according to Loyola Campus Safety’s website. Campus Safety Sgt. Tim Cunningham said Loyola recently published a post about the Parkland shooting online. The post discusses resources the university has in place to prevent emergencies and what to do in the event of an active shooter situation. People should locate exits and try to leave or hide if they can’t escape. Classrooms and conference rooms across campus also have special lockdown tools to prevent a shooter from coming into a room. The Chicago Fire Department didn’t respond to The PHOENIX’s request for comment.